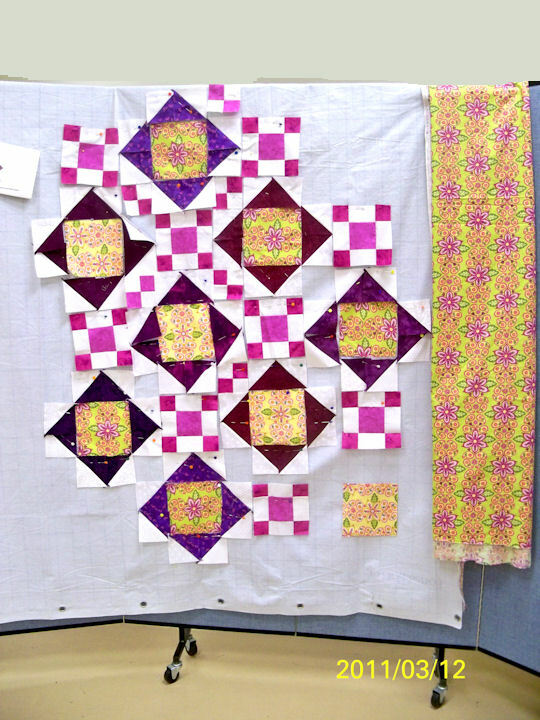 Sandy’s Quilting for the REST OF US podcast, Episode 043: In Which We Talk about Fabric March 27 2011, struck a chord in me that reignited a question I have been pondering for several years. 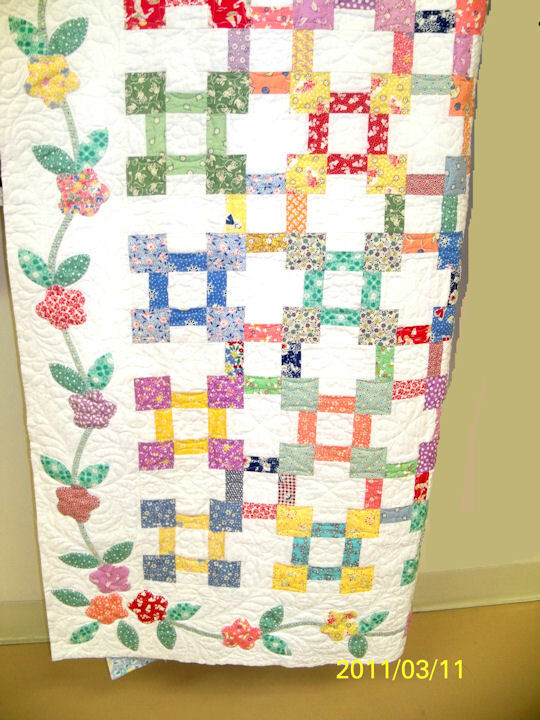 What was the quality of the fabric available to the early quilters? What could they buy at the local dry goods store? 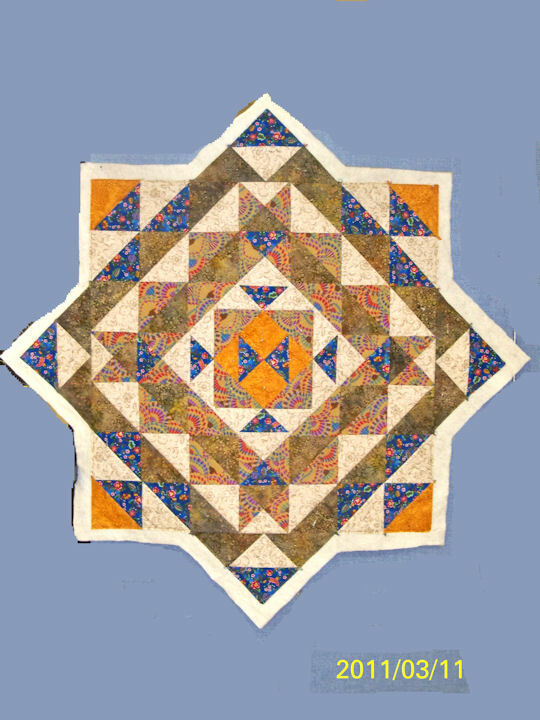 What was the thread count in the historical quilts that have survived? 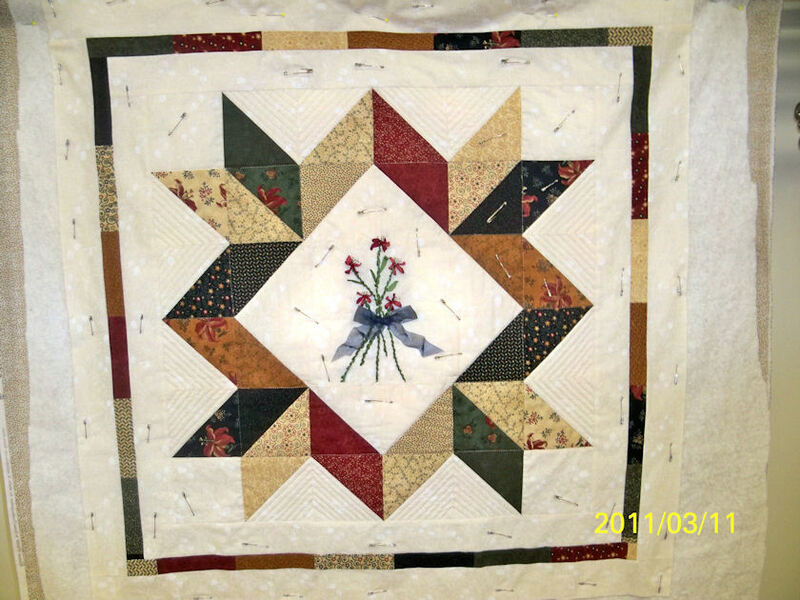 Yes I know about utility quilts some got used up some survived. 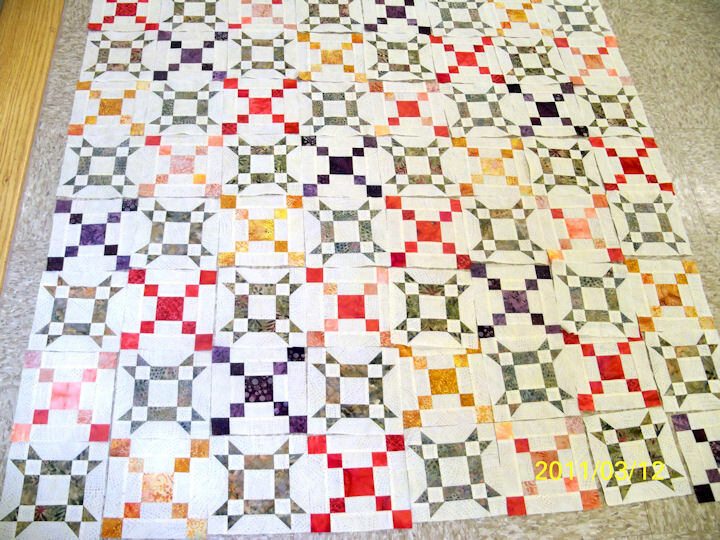 But I have also seen many historical fabric quilts and have always wondered about them. So today I sent off a number of inquiries to the various quilt and textile museums asking for the information or links to articles that I could avail for myself. I will let everyone know what I am able to find out. In looking for my information I struck gold! 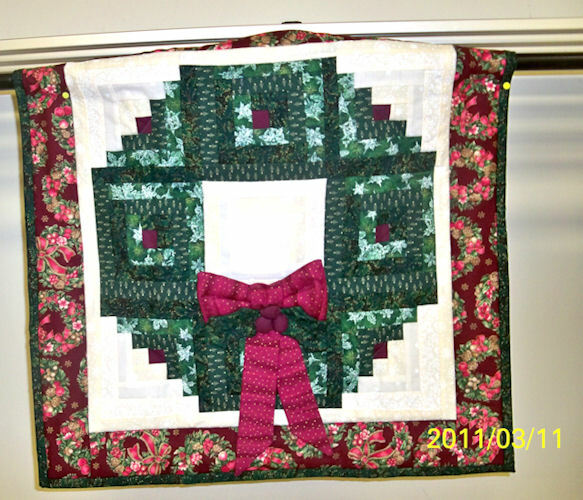 I found, some of the best links to great history and quilt information, available on line. I am including some of the links that I found of particular interest and will periodically post more links as I have the chance to view the information. BTW…. I PLAN A PODCAST FOR LATER THIS WEEK. I can hardly wait until I see this one finished! 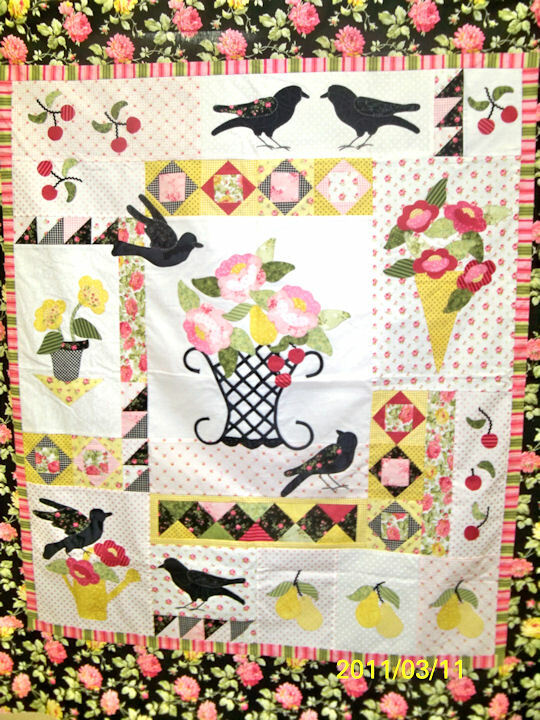 I am hoping the quilter who designed this pattern on EQ will write up and sell her pattern. I love it. The picture does not reflect the size ( Queen) of this lovely quilt . I have not posted for a while but I have a good excuse. I have actually been sewing. I got my quilt, THE QUILT FROM HEXX back into control. I finished all the blocks and got it assembled. 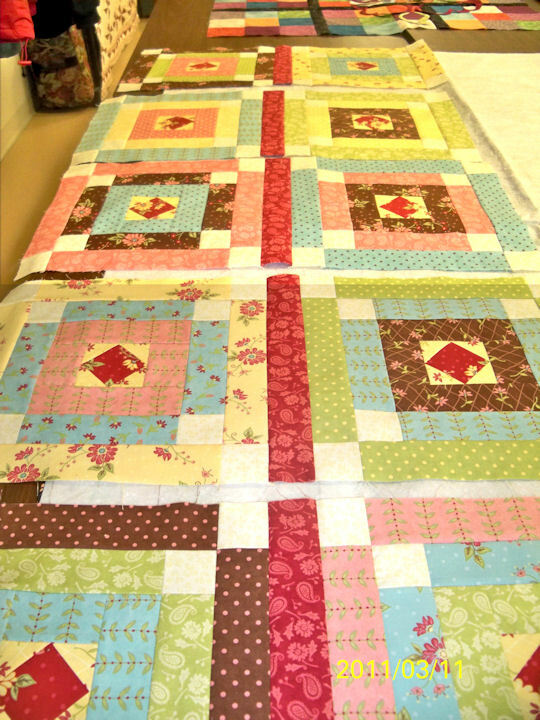 My goal was, to have my quilt finished, in time for Mary’s Sew In, an all day sewing event. I love this event and always get a lot done. No interruptions, food to eat (not on my regular diet), sewing and friends what could be better. Here are some of the pictures depicting my progress. In the future I will post the projects made by the other attendees. 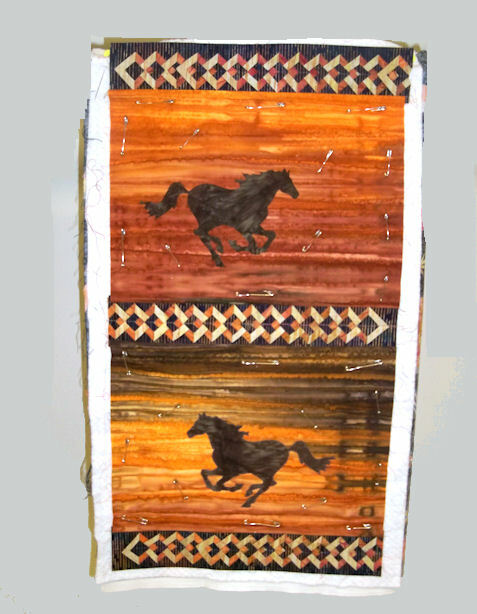 BTW, THE QUILT FROM HEXX will no longer be referred to with that name. It is going back to THE FABRIC TALKS TO ME for want of a better name. If anyone can think of a better name let me know. Next step, I need to get the borders on. 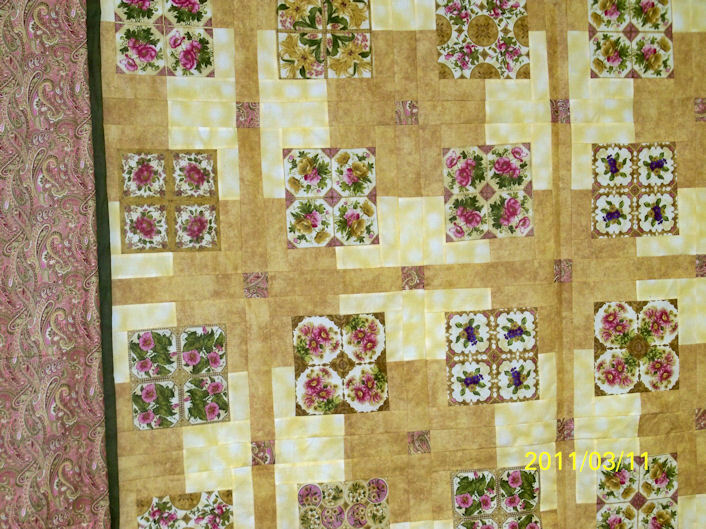 I am thinking of mitering the borders… but I am not sure, still deciding. I do not sew borders on at a retreat because I need all my concentration to get them right. At retreats I like to travel from section to section talking, taking pictures and viewing all the projects. In the future I will post some pictures but I have to edit the pictures. I like to remove the distracting backgrounds and my camera takes dark pictures that need to be adjusted. This is my pin cushion. 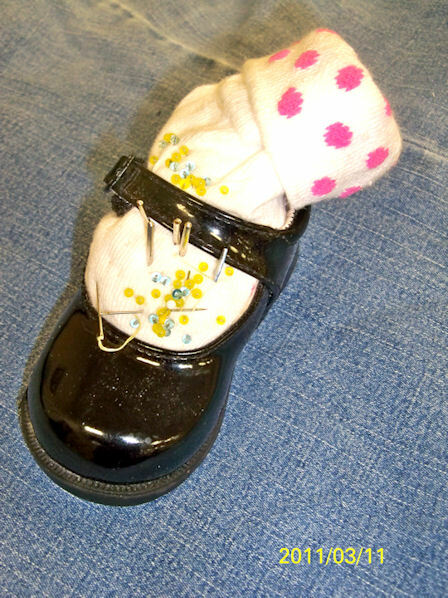 I bought it at a quilt show but I have since made pin cushions from my daughter’s shoes.. … those stay home so they won’t get lost. 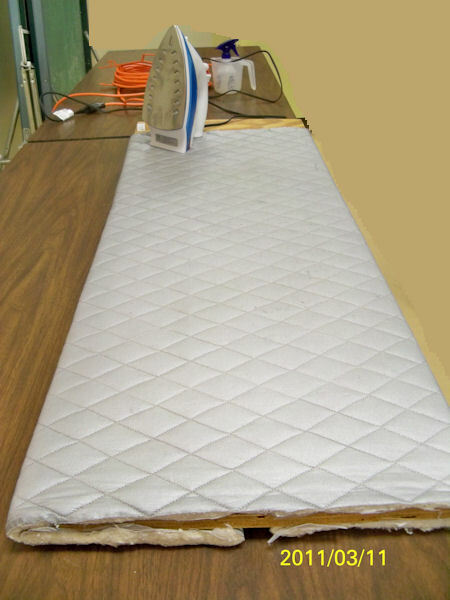 This is one of the ironing pad boards that was set up to share… simple, easy and mobile. 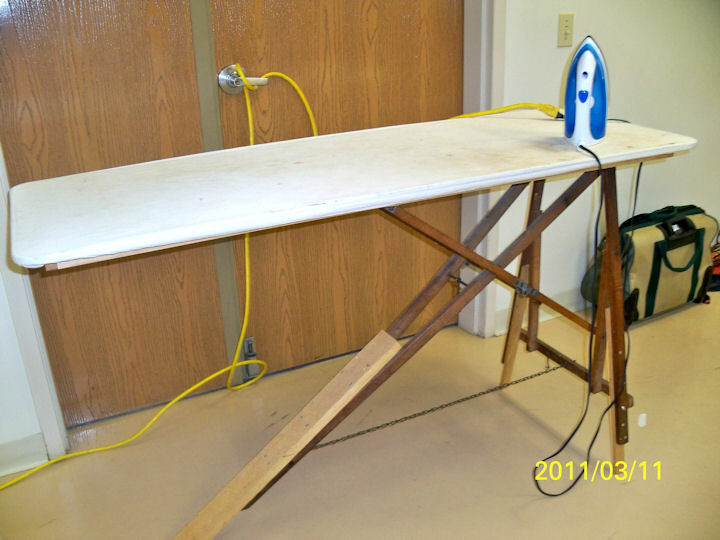 One of the husband fixed this old wood ironing board so that it meets the needs of the modern quilter. NOW, I have to find me an old wood ironing board… but maybe first I need a carpenter for a husband. 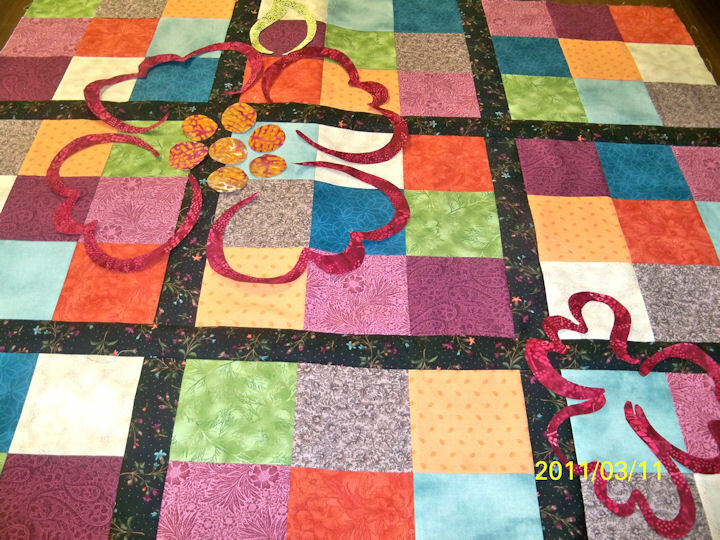 My quilt, THE FABRIC TALKS TO ME, on the design wall. I cut out the borders to sew at home. 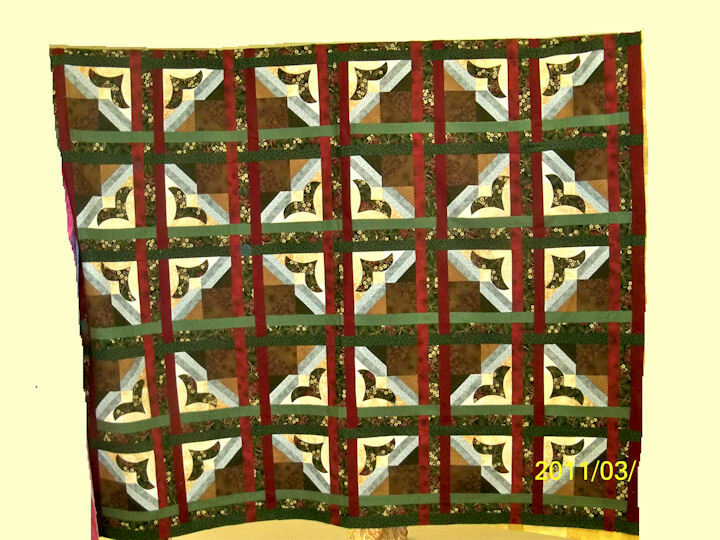 Did I tell you this quilt actually came out square? 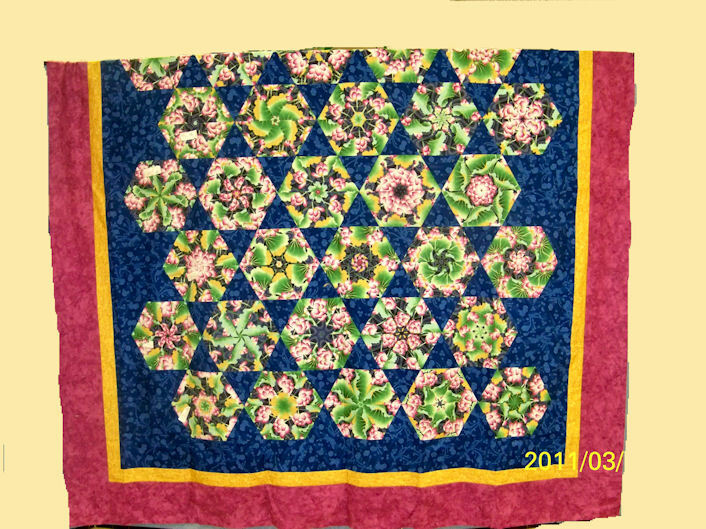 My newest quilt was from the Mystery Class I took at Elaine’s Quilty Shop in Hadley MI. I am just playing around with the design. I have to make sure to line up the floral strip in a consistent manner and I think I am going to use pink frames with the yellow focus fabric. 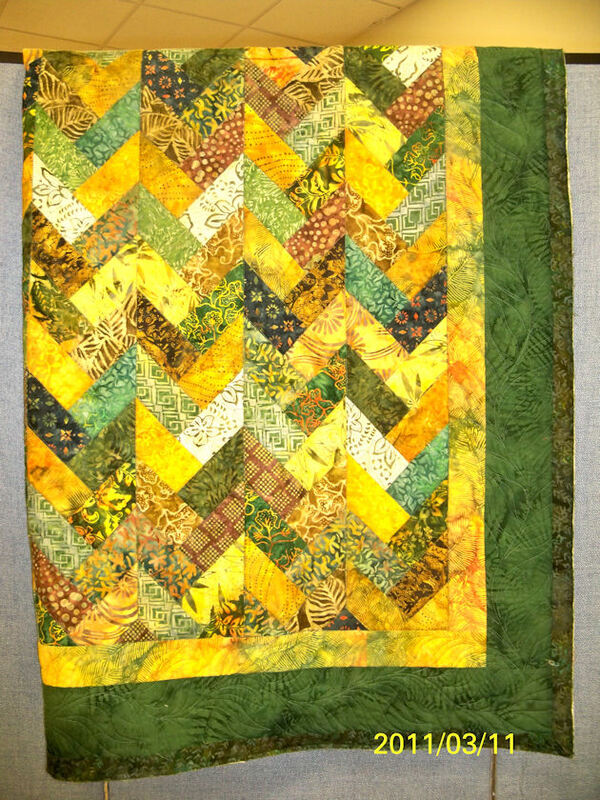 I like the diagonal progression of the green and yellow focus fabrics. I think this will work out to be a fun quilt for a little girl.